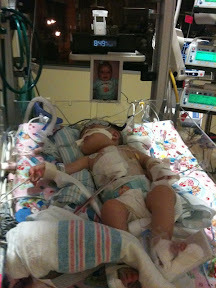 It's been 30 minutes now since the ventilator is not breathing for Abi and she's breathing on her own like a champ!!! The tube is still in since this is one of the tests but it seems like she will be off of it tomorrow morning. She's doing great breathing on her own, much slower now than prior the surgery and the saturation is much much better; it's in high 90s. Breathing on her own is wonderful to hear! I'm still praying. God is Great!!! Wow! That is so exciting! Thank you Lord! We pray that all 3 of you get a good night's sleep!